HONG KONG (Reuters) - One of Hong Kong's leading entertainment couples, actors Tony Leung and Carina Lau, were married in Bhutan in a Buddhist-inspired ceremony attended by the tiny kingdom's royalty, local media reported on Monday. Leung is one of Hong Kong's biggest film stars on the international art-house circuit and a longtime collaborator of prize-winning Hong Kong director Wong Kar-wai. Leung and Lau married in the reclusive Himalayan kingdom, known for its breathtaking, pristine natural scenery, on Monday at the exclusive Uma Paro resort. Newspapers and websites carried photographs of Leung and Lau, who have been together for many years, posing before a congregation of monks in red robes, Leung wearing a tuxedo and Lau in a white gown. Bhutan royalty reportedly attended the ceremony along with 100 guests, including Canto-pop diva and actress Faye Wong. "Thank you everyone for making such a long trip to attend our wedding. I believe it is destiny that gathers us together here," Lau was quoted by the South China Morning Post as saying. Leung, 46, is known for his cool, understated acting style in a raft of films by Wong. These include his depiction of a gay lover in "Happy Together" and as a cuckolded husband in "In the Mood for Love," a role that landed him the Palme d'Or for best actor at the 2000 Cannes Film Festival. Leung and Lau, 43, appeared together in the Wong films "Days of Being Wild" and "Ashes of Time"
Lau said she had chosen Bhutan for her nuptials after a spiritually uplifting visit to the snow-capped Himalayan kingdom. "I felt the peace the moment I arrived in Bhutan ... I could understand that people here are happy not because of their material life, but because of their satisfaction on a spiritual level," Lau was quoted in the paper as saying. Hong Kong actor Tony Leung has married long term partner Carina Lau in a Buddhist-inspired ceremony in Bhutan, according to reports. The couple's wedding was attended by royalty from the Himalayan country as well as prize-winning art-house director Wong Kar-Wai. Leung won a best actor gong at Cannes in 2000 for In The Mood for Love and starred with Lau in Infernal Affairs. Hong Kong's Apple Daily newspaper said local monks presided over the wedding. Infernal Affairs was Hong Kong's biggest box office hit in 2002 and scooped best film, best director and best actor at the Hong Kong Film Awards the following year. The film was remade by Martin Scorsese in 2006 as four-times Oscar-winner The Departed. Leung has also starred in Ang Lee's controversial drama Lust, Caution, while Lau has appeared in Ashes of Time and 2046. HONG KONG: Cannes best actor winner Tony Leung Chiu-wai and longtime companion Carina Lau got married at a resort in the Himalayan nation Bhutan, Hong Kong media reported Tuesday. Hong Kong art-house director Wong Kar-wai's Jet Tone Films confirmed the location of the wedding and released several photos from Monday's ceremony, but didn't immediately provide more detail. Hong Kong's Apple Daily newspaper reported Tuesday that a local monk presided over the wedding and other monks chanted prayers. The South China Morning Post said Leung donned a white suit and Lau a traditional Chinese red gown. The Apple Daily said guests included Wong, who directed Leung in movies like "In the Mood for Love" and "Happy Together," director Stanley Kwan, actress Brigitte Lin, singer Faye Wong and actors Chang Chen and Ti Lung. Wedding photos released Tuesday by Jet Tone showed Leung in a black tuxedo and Lau in a white wedding gown, posing next to a group of several dozen young monks in red robes. The couple also posed in traditional Bhutanese costumes. Leung's credits also include "Infernal Affairs," which Martin Scorsese remade as "The Departed," and John Woo's recently released Chinese historical epic "Red Cliff." He was named best actor at the Cannes Film Festival in 2000 for his performance in "In the Mood for Love." Lau, an actress, appeared in "Infernal Affairs II," "Center Stage" and director Wong's "Ashes of Time" and "2046." The bride, just like so many women about to be married, hoped for what she called “a quiet, solemn and romantic wedding.” Except she is the A-list Hong Kong actress Carina Lau Kar-ling and the groom is Tony Leung Chiu-wai, Chinese cinema’s biggest dramatic star. They say their vows today, Monday, July 21, at the Uma Paro hotel in Bhutan after a relationship that stood up to decades of popular scrutiny and almost 20 years as a couple. While Lau will probably still be able to remember her wedding day as the stuff of dreams, the Chinese media frenzy around it has been anything but quiet or solemn. 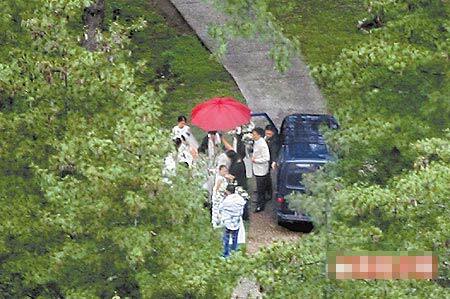 Since the incomparably tenacious Chinese entertainment press discovered the once-secret wedding locale on Monday, July 14, in typical fashion, the industry deployed considerable human and financial resources to cover the Chinese entertainment world’s marriage of the century. Dozens of reporters and photographers, and hundreds of thousands of dollars have relentlessly pursued the wedding party and their guests through three cities including Paro, in the remote Himalayan hills where the Buddhist ceremony will be held. The diplomatic language aside, in keeping with Lau’s desire for a private moment, the press has not been invited to the wedding, even as throngs continue to stake the couple and their friends. The bride, who won a prestigious Golden Rooster acting prize last year for “Curiousity Killed the Cat,” denied that landlocked Bhutan, which only allowed television in 1999 and continues to impose a complicated visitor visa process, was chosen mainly for its isolation. The date was set at the end of last year, when they decided to wed. Lau originally considered France, Italy and Japan until a friend suggested Bhutan, which she visited for four days last month and loved. “I long to live the simple and peaceful life of the Bhutanese people. The place is so peaceful and quiet,” she said. Paro remains relatively peaceful despite the media onslaught and the lengths the reporters have gone to get their story. By Wednesday, July 16, they found out the wedding party’s travel details. Leung’s management company believes at least six were on the flight from Hong Kong and one photographer attempted to take a picture of the couple, curtailed by airline staff. At least 20 trailed the group in Bangkok where they had dinner before flying to the Himalayan kingdom. One reporter is believed to have obtained the difficult-to-get and expensive Bhutan visa by applying in Russia. At the end of last week, several Hong Kong reporters were in Paro and many have spent a lot of time mainly lurking on roadsides hoping to snap images. On Friday, hotel security removed at least eight Hong Kong journalists who entered the premises of the luxury, Singaporean-owned Uma Paro. Some of the bridal party are billeted and the main wedding events will be held at the 20-room, 9-villa hilltop resort. Chan notes that the “Hong Kong style” in pop culture reporting has been a role model for the booming mainland media. She says: “In China, politics is sensitive and the government is more tolerant of soft news.” Local pop culture-oriented publications do “dramatically well” with advertisers, which is why the segment is growing, according to Vivek Couto, head of research at Media Partners Asia, a boutique consultancy. “Hong Kong doesn't really have much real hard news, so entertainment is very important. The field is very crowded so we have to do what we can.” says Mark Simon, group advertising director for NextMedia, owner of three of the territory’s five top-selling magazines. Partly because of their Taiwan revenues have grown and partly because their publications do well financially, NextMedia, listed on the Hong Kong stock exchange, reported that earnings for 2007 were up 32% and profit 52%. “Competition is fierce. Advertisers love entertainment news. So what if some guy is sleeping with some girl – the beer and cosmetic brands don’t care if you put them beside the story,” says Simon. Unlike in Europe and the US, most Chinese paparazzi work on staff for publications and not motivated by the potential earnings from a single photo. Hong Kong is one of the world’s most crowded media markets where hundreds of publications serve 7 million residents. On the weekend, NextMedia’s publications ran candid shots from Paro. The wedding of Lau and Leung, star of Ang Lee’s recent, critically acclaimed movie “Lust, Caution,” is irresistable to the Chinese entertainment press, also because of the personalities involved. As a friend of the couple, Hong Kong’s international award-winning art house filmmaker Wong Kar Wai signed up for an unprecedented and unpaid role: wedding planner. Wong, in an e-mail, said that a bit like his ambiance-drenched films, he planned to work with music to set the mood. The closely guarded wedding program includes a traditional tea ceremony for the bride, groom and their mothers on Monday morning, followed by a Buddhist blessing at 11 am., then an Italian lunch, capped by cocktails and a barbeque buffet in the evening. Sakul Intakul, florist to the Thai queen, designed the décor which incorporates bamboo with blooms flown in from Bangkok. Depending on the weather, Wong said he intended to use tunes ranging from Mendelssohn to Stan Getz, Chinese pop diva (and wedding guest) Faye Wong, to Sergio Mendes. The director’s frequent collaborator, film editor and creative director William Chang Suk-ping, has been doing visual direction for the event in Bhutan and found Lau’s ivory Vera Wang dress in Hong Kong. The guest list of 140 includes luminaries like producer Nansun Shi, martial arts star Ti Lung and retired Taiwan actress Brigitte Lin Ching-hsia, who have all traveled to Bhutan. 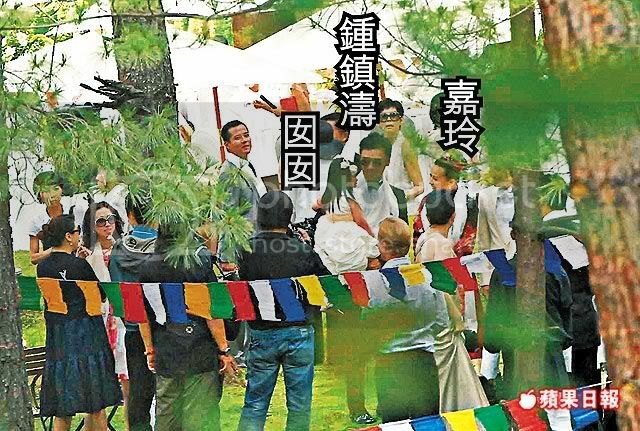 Fresh from a round of golf and being hounded by telephoto-lens toting Chinese paparazzi, Taiwanese actor Chang Chen, a wedding guest, on Saturday in a phone interview, described the mood among the party in Paro to be generally relaxed despite the media hoopla. Tony Leung and Carina Lau have known each other for about 20 years,with more than 10 years dating each other. The couples have yesterday became husband and wife in Bhutan yesterday. The couples were being blessed by Lamas with high attainments and being greeted with wishes by more than a hundred guests. The scene is warm and touching.The newly weds have also promised to work hard for a baby,which made many of the guest present cheer and support. Tony and Carina have ended more than 10 years of dating and have finally got into the next stage of life yesterday. The wedding ceremony took place in Bhutan's Uma Paro Hotel. It began at about 12 noon and ended at 5 in the afternoon,the ceremonies lasted 5 hours. Carina wore many outfits,which included a pink coloured Gucci evening gown,a traditional chinese dress,and a white tube dressed designed by Vera Wang. Her fingers wore a 12 carat diamond ring which is worth more than 10 million. Carina Lau look very elegant with outfits and jewelleries which worths a total of over 20 million Hong Kong Dollars. The site of the wedding is mainly in white. The wedding ceremony is in 2 sections. The first section is a Buddhist blessing ceremony,while is being hosted by the 17th Krampa - Trinley Thaye Dorje (High attained Lama from Tibet). The Lamas chanted their prayers for about 2 hours,the process is strict and consecrated. The guests were each given a joss stick,a silk banner,a silk ribbon and a seven coloured string as offerings and tributes for the Lama. Carina wore traditional chinese dress,with jade bangles and knelt infront of the 17th Krampa together with Tony Leung. The both received the 17th Krampa's blessings while kneeling on the floor. After the ceremony,the pair of couples followed the chinese tradition, to kneel infront of their parents and offer tea. The second part of the ceremony is western styled.Under the melodious tune of the wedding music,Carina,in a wedding gown and walked down the path that is full of fresh flowers with Tony. 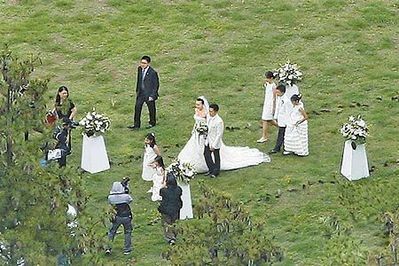 Leading the newly weds to walk the flower paths were the daughters of Kenny Bee,Faye Wong and Sheung Shan Sze Na. While walking,they were wished and greeted by hundreds of guests,which included the prince of Bhutan and his wife. The couples and their parents were very touched and teary,but did not cry. Tony and Carina told the guests during the wedding yesterday that they will work hard to get a baby. The guests cheered and supported. The couples have also announced that they hope to set up a Charity Fund,to help the people in needy. After the wedding ceremony ended in the afternoon,there was still a wedding dinner party in the night. It was rumoured that Kenny Bee played the guitar and Faye Wong sang during the happy occasion yesterday. Although the sky rained twice while the wedding ceremony is taking place,the Bhutan people believed that raining during a wedding ceremony is a sign of blessing from the heavens. The rain stopped coincidentally while the newly weds are cutting the wedding cake at the outdoor area. The wedding cake is 5 tiers tall,while cutting the cake,Tony grabbed Carina's waist,looked at her with a sweet smile,and kissed her. The scene is very romantic. Kenny Bee from Wynners have flown to Bhutan from Singapore,right after Wynners' concert ended. He was the last guest of the wedding party to arrive to Bhutan. Kenny Bee said "Carina have invited me from a phone call,i have brought a guitar to sing for the newly weds. I have waited long for this day. Seeing Tony saying goodbye to singlehood,i feel very happy for him. I have not married,maybe i will in the next 10 years." Eric Tsang whom have introduced Bhutan's prince, Daso Tobgya Dorji to the couples,told the reporters in a phone interview yesterday. "Carina expressed her wishes to have her wedding photos taken in the palace while meeting the prince when he is in Hong Kong. The prince have agreed to the request instantly." Eric also said "Carina have invited a Lama with very high attainments to host the blessing ceremony.Carina is already mentally prepared to be a wife and a mother when she agreed to marry Tony Leung." Many reporters were in Bhutan to record one of the greatest wedding in the entertainment industry yesterday. To get the latest and best photographs of the wedding process,alot of reporters and paparazzis tried every possible ways to get the best camera angle. Bhutan was raining quite often yesterday,the rain was uncertain. The helpless reporters outdoors became cheerful when someone specially went to send them wedding cakes and beverages. Carina have also prepared gifts of return to their guests. The gifts which is in the goodie bag included,a pair of chopsticks a photograph of the 17th Krampa autographed personally by himself,and a pouch made of pure silk with precious stones and silver inside. The gifts,prepared by Carina personally shows that she is very thoughtful to in planning. Although it is an Italian Cuisine dinner,no Italian Spaghettis were served in the dinner party,the dishes were rather plain but elegant. It includes oysters, lobster soup, lobster salad, beef cutlets, tuna fish, mushroom and cheese. The were 2 versions of desserts,one in chocolate flavour,the other, egg flavoured. 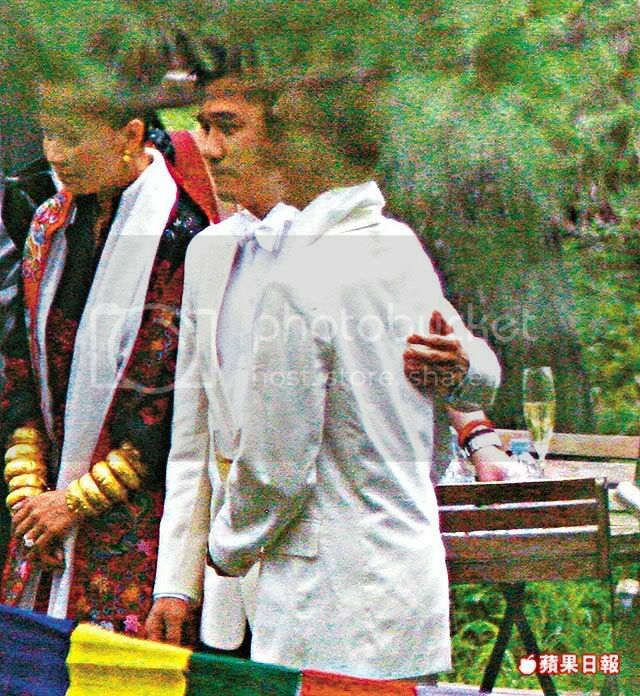 Long-time celebrity couple Carina Lau ''Liu Jialing'' and Tony Leung ''Liang Chaowei'' were finally married in the Hilmalayan kingdon of Bhutan Monday morning, HK reporters said. It took Tony, 46, and Carina 42, nearly two decades to get to the altar. They were married in a Buddhist ceremony taking place in the luxury Uma Paro Hotel, media reported, adding that about 20 lamas were seen leaving the hotel after the wedding. Their spokesperson reported that the ceremony had taken place in two parts – the first being a traditional Buddhist ceremony that is officially recognized as a marriage in Bhutan. For the second part, Carina showed off her 12-carat Cartier wedding ring, worth over 10 million Hong Kong dollars, as she cut her five-tiered wedding cake with Tony. Ming Pao Daily News said about 80 guests, including singer Faye Wong (Wang Fei), former actress Brigitte Lin (Lin Qingxia) and singer Kenny Bee (Zhong Zhentao), attended the ceremony. Celebrities such as Chang Chen (Zhang Zhen), Cecilia Yip (Ye Tong) and Stanley Kwan (Guan Jinpeng) were also present. Although the couple did everything to maintain privacy for their special day, they were still very understanding of the waiting press and issued official release photographs to share their happy day with the media and all their fans throughout the world.